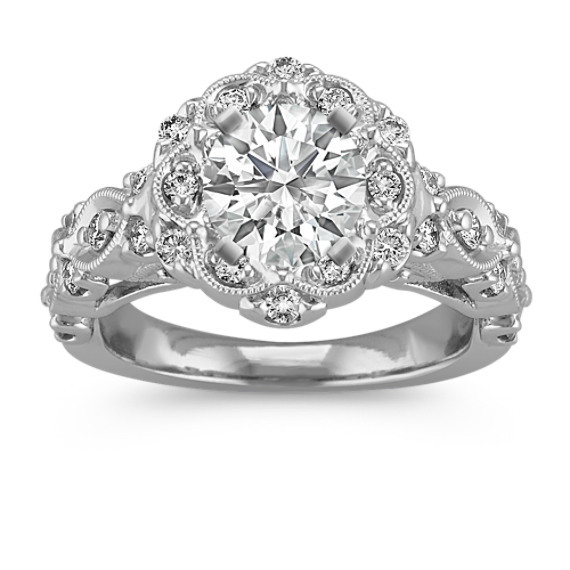 Vintage Floral Halo Diamond Engagement Ring | Shane Co.
As part of our exclusive Couture by Shane Co. collection, a unique floral design encases this vintage halo setting crafted of quality 14 karat white gold. Thirty four round diamonds, at approximately .62 carat total weight, are individually set among the top and sides of the ring, some delicately outlined by gorgeous milgrain detailing. The halo of this ring is made to hold a center gemstone at approximately 1.00 carat.